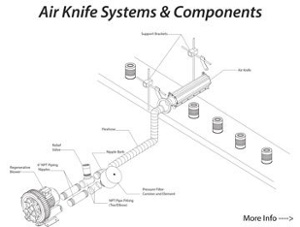 A long stainless steel tool with a thin, adjustable gap used for drying off products as they pass by on a conveyor. Unwanted pressure buildup within a regenerative blower piping system. Back pressure can cause the regenerative blower to overheat often burning out the bearing or the motor. Back pressure is the number one cause of regenerative blower failure. An industrial machine utilized for moving large volumes of air. Centrifugal Blowers produce greater flows than regenerative blowers but produce less pressure. An NPT threaded valve that opens in the direction of air flow and closes when there is no air being pushed through the piping. The purpose of a check valve is to prevent unwanted debris from being sucked into the blower. A regenerative blower that utilizes two impellers in order to produce high quantities of air flow and pressure. 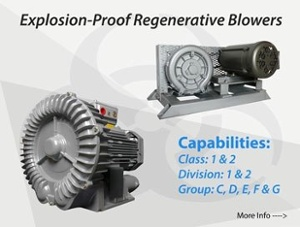 A dual stage regenerative blower will produce greater pressure than a single stage regenerative blower. An aluminum rotor used within regenerative blowers in order to increase flow and pressure. Atlantic Blowers’ impellers are dynamically balance. National Pipe Thread- The United States standard for threading on fittings and piping. Atlantic Blowers carries NPT threaded accessories. The process of transferring materials from one place to another by force of air. A canister used to filter the ambient air being pulled into a regenerative blower system in a pressure application. A Pressure filter canister ensures that the air being used is clean. The pressure filter canisters use polyester, paper, or HEPA filters. An industrial machine which utilizes one or more impellers in order to produce high quantities of air flow and pressure. 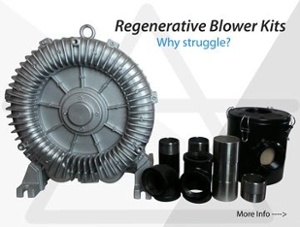 Regenerative blowers are utilized in many different industrial applications that require air or gas transfer. An NPT threaded valve that releases unwanted and dangerous pressure build up known as backpressure. A cylindrical NPT threaded accessory that lowers the decibels of sound a regenerative blower is producing. A regenerative blower which utilizes one impeller to produce high quantities of air flow and pressure. A single stage regenerative blower will produce less pressure than a double stage regenerative blower. The process of pushing air through a body of water. Tank aeration is performed in order to transfer oxygen throughout a body of water. A canister used to filter the air being pulled through a vacuum system. A vacuum filter can be used to collect dust or other debris and ensure your blower stays clean. The vacuum filter canisters use polyester, paper, or HEPA filters.